At South-Tek Systems, we pride ourselves on not only creating safe, efficient and reliable N2 generation technology, but also on delivering superior customer service and personalized attention to each of our valued customers. And while we fully believe our products can speak for themselves, we are always tremendously appreciative of customer feedback. Below are a few testimonials from satisfied customers as well as additional information on the benefits of using our systems. If you're in the market for a safe and effective Nitrogen Generator, read what these folks had to say and then give us a call to learn more at 888-526-6284. Testimonials like this one from Bill are a great example of why we put so much effort into building customer relationships. We know the power of the word of mouth, especially in industrial and manufacturing industries. The fact that Bill and his colleagues have helped spread the word about our company and the Nitrogen Generators we produce, helps us know we're succeeding in our efforts to maintain a high standard of quality products and top-notch customer service. We understand that with every customer, there is an opportunity to exceed expectations as well as gain more business in the future. So thank you Bill! We don't believe in just selling our clients a machine and calling it a day. We take the necessary time to help them identify their N2 generation needs, work with their budget, and measure the performance of the equipment once it's installed. Thank you Timor for your positive feedback! 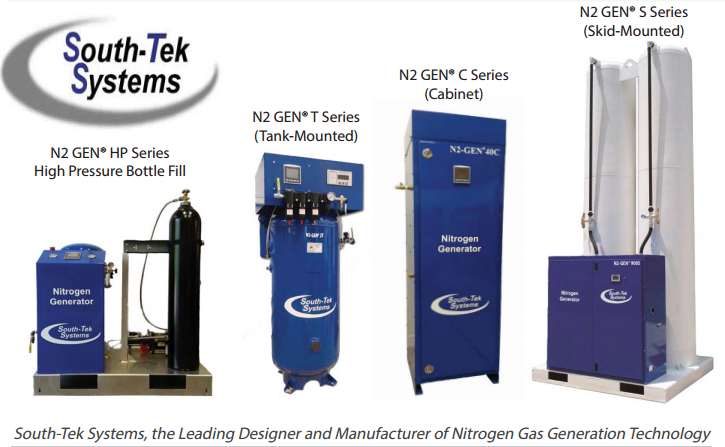 With a Nitrogen Generator from South-Tek Systems, your facility can generate its own supply of N2 gas on demand. This can help reduce Nitrogen costs by up to 90 percent when switching from expensive gas/liquid N2 contracts to installing one of our on-site generators. Furthermore, the initial expense of purchasing and installing our products usually pays for itself in very little time. Our studies show an exceptionally quick payback with ROI averaging between 12-14 months when compared to bulk liquid. For more information, please give us a call at 888-526-6284 or contact us online. We look forward to hearing from you!